me and him: somebody stole my slipperboots. i'd like them back now. please. my sad, frozen feet need them. real bad. while it's the other foot's turn to get warm. slipperboots are the only cure. has anyone seen these in stores this season? if anyone has seen them pa-leeease let me know! Old Navy has them again this year. And they're super cute! Saw them at walmart too.... liked the striped grey ones the best! No...it was not me that took your boots. However, Gap has some pretty nice ones this year online. Check in your trunk. That is where I found my checkbook I lost for a week! hey geri, those are super cute boots, sorry their missing. so sad... i'll keep my eyes open. Hey so thanks for the congrats on Colt's dental school. It made me think if we ever told Jason congradulations for getting into school. I will say i'm jealous you will be in california. hehe but really tell him congradulations, he deserves it! Have you asked Jason? Maybe their with your floral pants that DI wanted back. Sounds like the perfect reason to buy a new pair. You said your old ones were a little worn anyway. You NEED them. 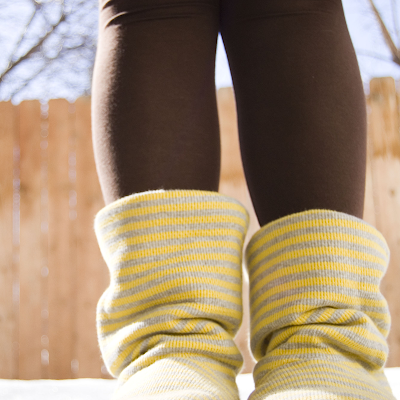 old navy's got sweater boots, but none quite as cute as those. p.s. i like the new header. very festive :).